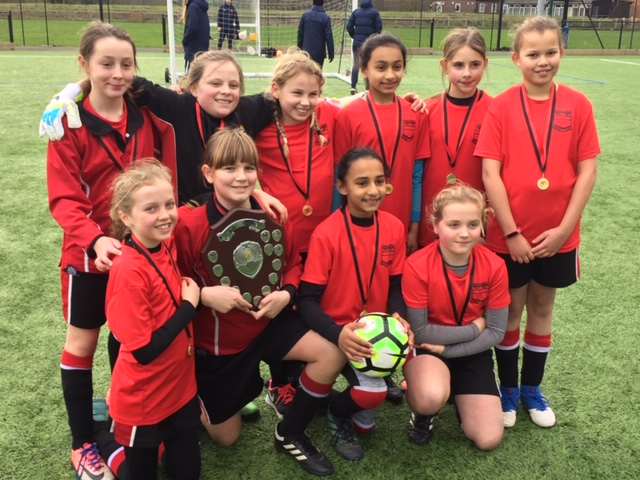 Our Under 11s girls retained the County trophy after putting in a superb display of football throughout the day in this competition. Playing at Strode College against all the winners of the local schools tournament we were put in Pool A. 2nd game vs St Joseph's (Burnham on Sea) - Hugh Sexey's won this game 3-0. The girls showed some great footballing skills, passing the ball around and enabling Katie Holmes, Ella Holmes and Anika Badhen to slot the ball home and give us 3-0 win. It was a very good game to watch and both schools played well. 3rd game vs Weston All Saints - Hugh Sexey's made some changes; superb goal keeping from Maddy Rousell kept Hugh Sexey's in the game. This game was heading for a 0-0 draw until Anika Badhen found the net quite late in the game. 4th game vs Holy Trinity - Hugh Sexey's confidence was high. The girls immediately put pressure on Holy Trinity and with goals from Ella Saxon (2) and Abbie Badhen (2) we won the game 4-0. Special mention must go to Evie Williams; despite only being in Year 5 she defended superbly and held her own well. Lucy Taylor made her debut in goal - we are lucky to have 3 girls who enjoy playing in goal. 5th game - East Coker - Hugh Sexey's made some changes to rest some players for the later stages. Indah Kayira showed everyone what a great player she is - she can play in any position and do the job well. East Coker won the game 1-0. Just one of those games where we couldn't finish, and their goal keeper was on very good form. Hugh Sexey's came runners up in the Pool A and progressed to the Semi Finals playing against Somerset Bridge. Semi Final - vs Somerset Bridge. This was a VERY good game of football. Captain Ella Saxon did a great job rallying the girls and psyching them up ready for this match. It was a very even sided match. There was some great work from Ella Holmes in midfield, passing the ball to Ella Saxon who superbly set up Abbie Badhen; Abbie slotted the ball home scoring the only goal in the match and putting Hugh Sexey's in the final. This was a fantastic team effort and goal keeper Katie Holmes was superb, keeping a clean sheet. Everybody, including all the spectators, was nervous. 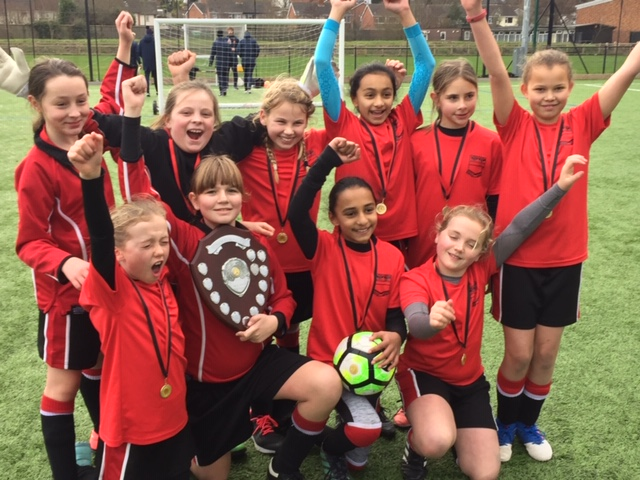 St Nicholas proved to be a good side, but after periods of good football from both schools, a long field kick from their goal keeper resulted in Ella Saxon booting the ball from past the half way line straight in to the top corner of the net, (a typical David Beckham goal). A superb goal; definitely one of the best goals I have witnessed from the touch line. It was brilliant and I was delighted for Ella's parents - quite an emotional moment. After that there was some pressure from St Nicholas, but superb defending from Hugh Sexey's. Ella Saxon then scored a second goal, which ended the game 2-0 and crowned Hugh Sexey's as Champions!